The Law Clinic team is headed up by our Joint Student Directors Kieran McGrath and Helena Arthur. 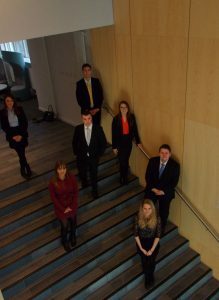 They are supported by a strong and experienced management team, consisting of our Operations Manager Louise Thomson, our Office Manager Samantha Whyte, our Knowledge Managers Danielle McDonald and Leona Baillie, our Outreach and Street Law Managers Taylor Pollock and James Wood, and our Media Manager, Jenna Neil. Backing our management team are a variety of dedicated Assistant Managers and Student Advisers. Hover over “The Team” bar above to view our individual pages!